Fall is upon us, and it's my favorite season. 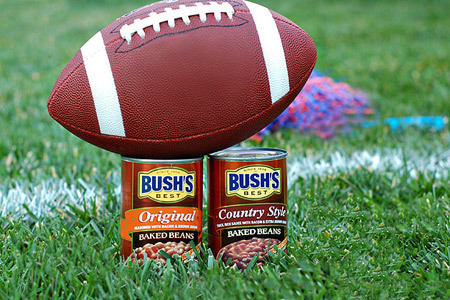 Of course fall means football, and I'm very pleased to be teaming up with the great folks at Bush Brothers to spread some gameday love and grilling ideas. This weekend I'll be hosting a driveway tailgate party for our church youth group where I'll feature a couple of great grilling recipes that are tailor-made to accompany Bush's Beans. Bush's are my go-to beans, and I'm looking forward to bringing you what I hope are some inspirational recipes. This Saturday the Falcons of the Air Force Academy roll into Boise to try to drop some bombs on our hometown (and #5 ranked) Boise State Broncos. It's homecoming for the Broncos, and it's also the first time that the two teams have met on the field. It's going to be an interesting game for me, given that I'm an Air Force veteran. I honestly can't pick a team to root for, so I'll weasel out and pull for both teams. Stay tuned for the featured recipes. In the mean time, here are some tailgating and cookout tips that I hope will lend to the success of your next event. Pre-prep(aration) is the key to stress-free success! Simply put, do as much as you can as far in advance as possible. Many dishes, like beans, composed salads (such as macaroni or potato), sauces, dressings, etc. can be made not just the day before, but a few days in advance. Of course, you should always follow good food safety and storage practices. Disposable is your friend. I highly recommend the use of disposable containers when preparing your gameday grub -- especially if you're going on the road. Foil pans and zip-top bags will save you a ton of hassle and clean-up. Have a plan and follow it. Run through the event and cooking schedule in your head and put a plan to paper. You have to know how you're going to manage your cooking space and the various cooking, holding, and serving times. You don't want to be figuring all of that out on-the-fly as you go. Disclaimer: This cookout is in partnership with, and sponsored by, Bush Brothers & Company. Looking forward to your recipes and tips! Fly high AIR FORCE!! Good outfit to hook up with. I wish my great grandfather had founded a similar company - they've come a long way. We occasionally drive by the Chesnut Hill location when we go East.